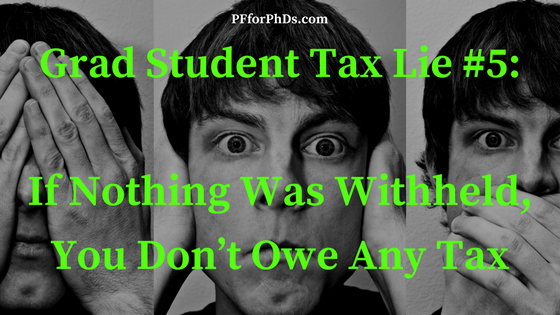 Grad Student Tax Lie #5: If nothing was withheld, you don’t owe any tax. This lie starts with the assumption that the it’s the IRS’s responsibility to collect the tax due. Instead, it is truly up to the taxpayer to send in the appropriate amount of tax due, either once per year in tax season or on a regular basis throughout the year. There are lots of types of income other than grad student non-compensatory pay that do not or may not have taxes withheld from them, and the responsibility is still on those taxpayers to sent in the right amount of tax in a timely manner. Graduate students with assistantships will receive W-2s at tax time and will likely be required to set up income tax withholding. Domestic graduate students with fellowships, on the other hand, may or may not have taxes withheld from their stipends. Some universities offer graduate students with fellowships the opportunity to have taxes withheld and some do not. If your university does have a system for withholding taxes from fellowship pay, doing so will likely help your money management. If you are not having tax withheld from your stipend, you need to check whether you are supposed to pay quarterly estimated tax or simply send in your tax due once per year. Tax lie #1 and tax lie #4 explain in more detail that fellowship pay is taxable. See the tax lies home page for a full list of tax lies that graduate students should not fall for.